A fair warning: this one is a little depressing. There was a point in my teacher credentialing program when we had to talk about disasters. And not just the natural kind—living in the US, we had to talk about school shootings as well. Despite the statistical improbability of ever being involved in one, as future teachers we were told to steel ourselves for the possibility. If worse came to worst, we would put our lives on the line for our students. In any emergency, the teacher is the last one out the door. In School-Live, Sakura is forced to face dire circumstances in the form of a zombie apocalypse, and in the end she sacrifices herself in order to keep her students safe. This event is traumatizing enough to one of the students that she continues to hallucinate about her, begging the question of how much of her characterization is actually presented through rose-tinted glasses. However, there is evidence for the genuine nature of her sacrifice all over the series. Even in death, Sakura’s zombie is in a spot meant to lead the girls to freedom. She leaves behind a key that gets them the medicine they need to prevent becoming zombies themselves. 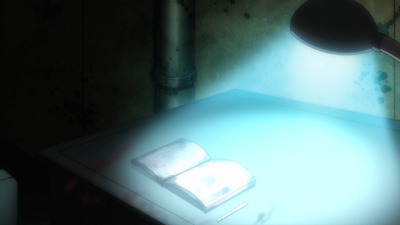 And after the reveal that the zombies follow the same patterns that they do in life, it’s shown that Sakura still writes in her journal—a wish for her students to be safe, over and over again. It’s clear that Sakura is meant to be tragedy material, and a few other details in the show hint that she didn’t want to give up so easily (the bloody handprints on the medicine case, for instance). However, I can’t help but admire a character who is so dedicated to her students that even when it meant her own death, she chose them over herself. While that sacrifice is simultaneously horrifiying—was there really no other way?—her demonstration of bravery is what eventually snaps Yuki out of her fantasy world and saves everyone else. Rest in peace, Sakura. You did a great job with those kids.